The Moot Hall was built during the first half of the 16th Century; the experts agree. Beyond that, however, there is no certainty. No documentary evidence exists; the style of the building suggests to one expert that it was built about 1520 and to another about 1550. We must be content with that. What we do know is that the building of Aldeburgh’s Town Hall coincided with the beginning of a period of prosperity in the town which lasted approximately 150 years. 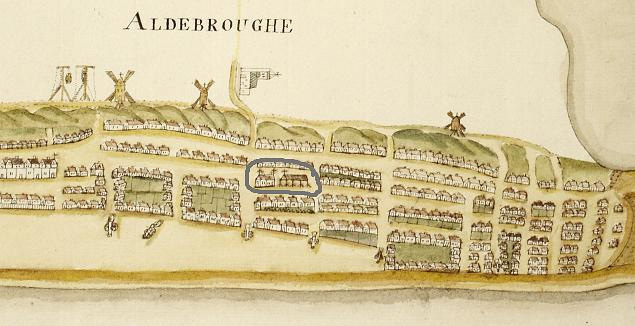 (Above) – The Moot Hall show on a map dating from 1589. Note its relatively inland location compared to today.